While I was squawking about how Jim Sensenbrenner issued a manager’s amendment (aka USA Freedumb) purporting to end bulk collection by tying everything to a “specific selection term” without defining what “specific selection term” meant, the House Judiciary Committee released an updated version of the bill defining the term. All the relevant invocations of the term now refer back to this definition. The language not only doesn’t convince me this bill works, I think it validates my concern about the bill. That’s because the word “entity” is already too loosely defined. Is this like the definition of the entity that struck us on 9/11 that Presidents have expanded anachronistically? Al Qaeda = AQAP = al-Nusra? And in just about every case imaginable — an entity’s phone numbers, its bank accounts, its email addresses (though perhaps not domain name and IP) — there is a necessary translation process between the entity and the selector(s) that would be used for a search. That this translation happens shows up in some of the invocations of “specific selection term” where they say the “specific selection term” will be used as a “basis” for selecting what to actually search on, as with the Pen Register section. Al Qaeda is not the name of the telephone line (or facility, which itself has been an invention used to conduct bulk collection in the name of a specific selector). This “basis for” language shows up even with the NSL language. But you don’t have to take my word for it. You can look at a program that relied on “specific selection terms” “as a basis for” unbelievably vast collection. And here’s what that discussion evolved to look like even by 2007. Mind you, the individual queries based off these specific references to the entities associated with al Qaeda (and Iran) were just that — individual account numbers of some sort (which is, again, why I think individual account identifiers might work). But the process of translating between the specific selection terms — al Qaeda and others — to specific identifiers involves the potential for using far broader terms than just an account identifier. It also, at one point, included over 27,000 identifiers that could be searched (albeit all individually). 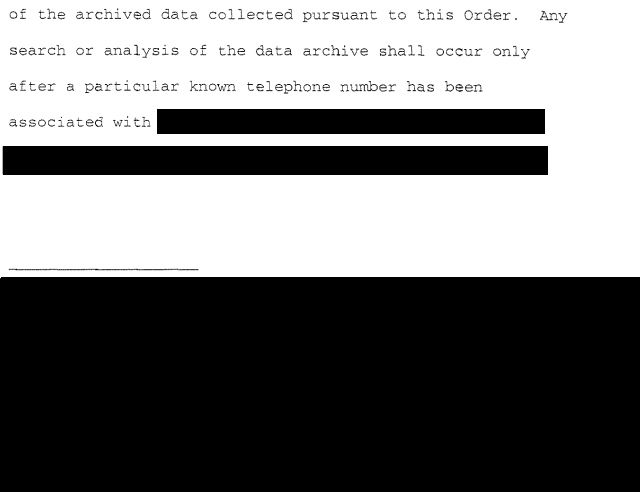 The phone dragnet used specific selection terms as the basis for selecting which actual identifiers it queried. And while in this case, that still represented individual queries, it did lead to vast numbers of individuals queried. So I think once you include “entity” in the definition, it makes the value of “specific selection term” pretty limited as a way to prevent bulk collection, because it invites the translation of that “entity” into something that is not an individual account but rather something far broader. There’s no requirement that the specific search term and the queries it is used as a basis for have the same one-to-one correspondence laid out in the definition. Interestingly, one of the two other things I saw in the update on quick pass (the other being a fix to language that could have been used for a third hop) is, along with the extension of the PATRIOT sunset, the extension of language from IRTPA that made those who engage international terrorism or simply activities in preparation for international terrorism an agent of a foreign power under FISA. I’m not surprised by this nor am I sure what that means (though it may support my observation that “agent of foreign power” drives this collection, not terrorism). But it also reminds me of how William Webster yoked this IRTPA language to Section 215 in his Nidal Hasan report. That is, the government seems to want to make sure that its ability to query on people doing something that may or may not be tied to preparation for international terrorism will remain linked to its use of Section 215 to conduct that query. I find that interesting. Update: Here’s evidence I’m worried for nothing. The government motion to amend the dragnet order written in response to Obama’s effort to get queries pre-approved by the FISC describes “seeds” as specific selection terms. Not only does this establish a one-to-one correlation (or at least an identifier to query term correlation) with this language, but it sets a precedent at the FISC that specific selection term should mean actual query terms. That’s not much of a definition. It could cover anything. entity = terrorist = enemy = anybody taking a non-government or anti-government position. 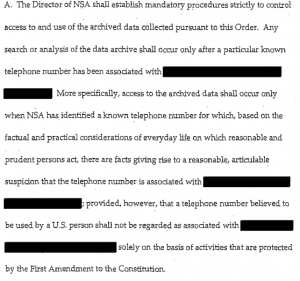 NSA Destroyed Its Illegal Content-as-Metadata Data in 2011 Will the Dragnet Reform Criminalize Ordering Pizza?